Cat lovers of the world unite. 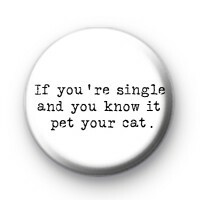 This black and white 1 inch pin badge is for all the people that are proud to be single and adore their cat! So if You're Single and You Know it Pet Your Cat!